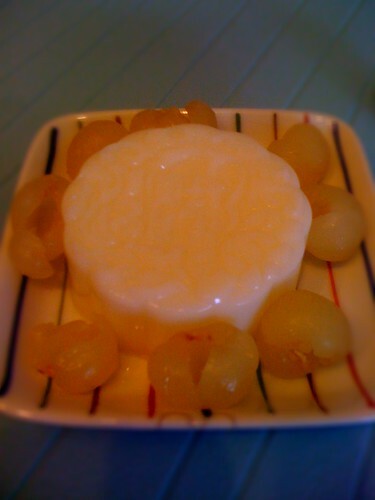 Almond jelly with longans is one of my all-time favourite dessert. Despite so, it was not until recently that I finally decided to try making it myself after being a little fedup with the stinginess of the dessert stalls for heaving so much shaved ice on the few sparing cubes of almond jelly at the base of the bowl, topped with three, perhaps 4 pieces (if you are lucky) of preserved canned longans. Longans are in season and I managed to get my hands on some fresh longans at NTUC Fairprice before heading to the baking section where I found three brands of almond jelly premix powder on sale. 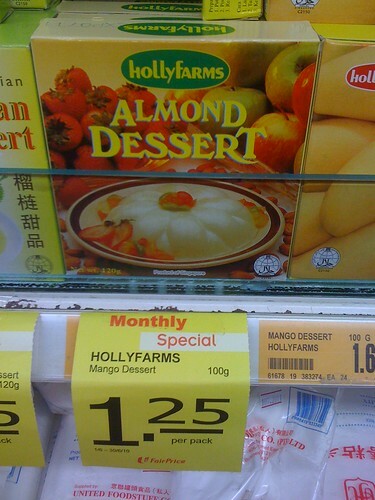 The most expensive brand cost $2.20 while the cheapest brand (Hollyfarms) cost a mere $1.55 - which is a whopping $0.65 or 30% price difference! In the good spirit of wanting to validate whether quality is indeed proportional to price, I proceeded to make my purchase on two packets of almond jelly powder - the most expensive and the cheapest brand. The almond jelly making process is fairly simple and straightforward if one were to dutifully follow the cooking instructions at the back of the packet. It simply involves the dissolving of the powder in boiling water, the pouring of the almond solution into a jelly mould and refrigerating it till the jelly is formed. * The more expensive brand yielded somewhat whiter and more porcelain-like almond jellies while Hollyfarms yielded more natural and normal-looking almond jellies (I definitely prefer the appearance of the latter). * Taste-wise, it's not so much of a difference but I would rather prefer the Hollyfarms almond jelly as I find it to be slightly denser and closer to my personal liking. Morale of the story: Good ingredients/food doesn't necessarily come at a higher price tag.